Eggs are a staple in this house. I buy them three dozen at a time and endure funny looks from the cashier. The reason is that I eat two boiled egg whites each day, plus eggs are the basis of my protein muffins. (4 grams of protein for just 16 calories). But I still love scrambled eggs for breakfast, lunch or dinner. This does, however, require a bit of skills, or else you'll end up with rubbery, burned nasty eggs. 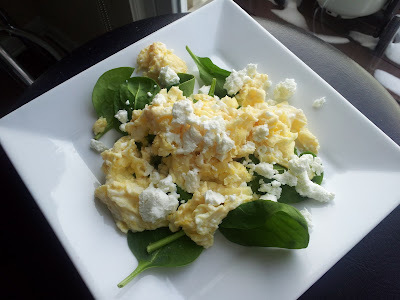 Here's my method, which this morning, included goat cheese on a bed of spinach. Whisk together the egg whites and egg until fully incorporated. The egg whites shouldn't be easily visible anymore. Preheat the skillet to medium heat, then spray with oil. Pour the eggs into the skillet, then allow to sit for a few seconds until the edges bubble. Using a spatula, pull the edges towards the middle of the skillet, continuing to fold the eggs. Remove from the heat while the eggs are still slightly runny, but don't remove from the skillet right away so the eggs may continue to cook. Top with salt and pepper to taste and whatever other fixings you choose. I personally like salsa, cheddar cheese or goat cheese.